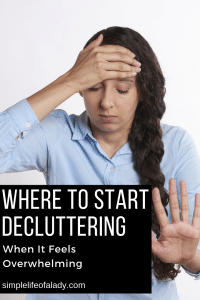 Like every homemaker who wants a clutter-free home, I also wondered where to start decluttering when you feel overwhelmed. 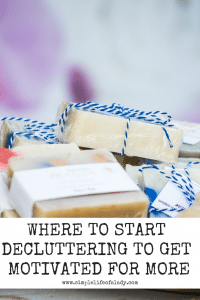 When I decided to jump to the decluttering process, I started with my bedroom. Because it’s the room that I felt like I have total control. And I want to have peaceful nights and mornings. Who doesn’t want that? I’ve had some success, like I was able to declutter and organize my closets and drawers. I’ve had things sorted. I know now which ones I am going to sell. Some I’ve kept for “just in case” times and some are kept and are there to stay for a year so that I’m sure if I really won’t need them anymore. These are small accomplishments and I’m glad that I have been able to do these for just 15 minutes a day. However, I still can’t consider my bedroom as fully decluttered and organized. So if we talk about success where we can put a check mark on it, I’m not there yet in my bedroom. If I’m going to follow through and estimate how much time do I still need to fully declutter my bedroom, I’d say, a month, for 15 minutes everyday. Now we all want quick wins. Not only because it feels good, but it is motivating and makes us want to do more. It lessens that overwhelming feeling we initially have at the start. Small wins like being able to declutter a closet, drawer, dresser, are all good. But who doesn’t want a whole room fully decluttered in less than a day? Now the rooms in our homes are not created equal. There are bigger and smaller rooms. You may find that some rooms tend to accumulate a lot of sentimental clutter. One may be just so hard to declutter and organize and feels so overwhelming to look at. If you feel this in one of your rooms, don’t start there. You will need more momentum and motivation to tackle that clutter. Then there’s a room that proves itself to be the easiest to declutter. This is where I will forever be thankful to June of This Simple Balance for sharing her idea. The easiest room to declutter is none other than the bathroom! So if you wonder where to start decluttering when you feel overwhelmed, start in the bathroom. I know, I said before that it’s good to start in your bedroom. But this is just because it’s where I started and I really craved for a nice place to sleep. Now I realize, it’s one of the hardest rooms to declutter. 1. It’s a small space. Usually, it’s the smallest room in the house. So it’s the easiest room to declutter. It might not even take you an hour for it. 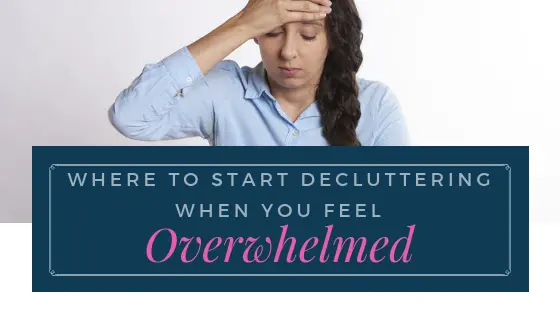 In fact, if you don’t have a lot of things in there, an hour is enough not only for decluttering, but also for cleaning and organizing what remains. When you succeed in decluttering your bathroom, even if it’s the smallest space in your house, the result that you’ll see will be enough to give you the motivation you need to tackle the remaining rooms in your home. 2. There are less sentimental items in the bathroom. We don’t keep memorable or sentimental items in the bathroom. Mostly, it’s just towels, makeup and half-used shampoo. So it’s not hard to make decisions on whether we should throw something or keep it. 3. Lots of things to throw without any guilt. Toiletries, cleaning supplies, hair products, you name it! Being able to purge items without feeling guilty builds up momentum and exercises your decluttering muscles. It instills in your mind that many unused products you have deserve a better home. It trains you to think that some items may still be good, but you’re not using them so giving them away is better than holding on. And it convinces you that some are just not worth it anymore and it’s okay to throw trash! Take a picture of your bathroom before decluttering. This is the thing that I always forget. When I declutter, I usually jump to it at once, especially when I feel like doing it. It’s better to take picture of your bathroom first. I didn’t get a chance to take a picture the first time I decluttered our bathroom. Thankfully, I decluttered it again. That’s when I took a before picture. So when you’re ready to declutter, take a picture of it first. Then every time you finish your 15-minute decluttering session, take a picture of it. Seeing your progress every day, no matter how little it is, is enough proof that you can succeed in decluttering! Perfection is not the goal. Your bathroom is a space that is used by actual human beings, not an ad for Target. It should look great, work properly, and give you a relaxing feeling, but it doesn’t have to be like the sparkling, shimmering, splendid bathroom that you see in ads. What matters is that it should work well for you and your family’s needs. That is the real goal. 1. Remove the things that you don’t need in there anymore. 2. Focus on one clutter area at a time. You don’t have to hurry. Just 15 minutes everyday is enough. What’s important is that you get to build the habit of decluterring over time, so that it becomes easier each time you do it. Now here are the clutter areas to focus on when you declutter your bathroom. 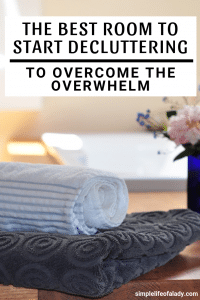 Again, focus on one clutter area only for each decluttering session so that it doesn’t feel overwhelming. If you can do it for less than an hour, do so. The results feel amazing! 3. Only retain products that you use everyday in your bathroom. This is why I had to declutter our bathroom the second time around. There were products still taking up space but we don’t use them everyday. Some are for travel and others are stockpile. True enough, the less stuff you have, the easier it is. So find a room inside your cabinets for the products that you don’t use everyday, especially stockpile. Decluttering the bathroom is one thing. Keeping it that way is another. But organizing gets a lot easier when what remains are only the stuff that you need. Here are simple ideas you can follow to keep your bathroom free from clutter. Be selective with what you put on display. Organize your bathroom cabinets and drawers. Don’t buy a new item if you do not have a space for it. Now that you’ve discovered that the bathroom is the best place to start decluttering, what are you waiting for? Flex your muscles, head on to the bathroom and start decluttering! When you’re done, you can read these articles for organizing tips and inspiration. 12 Easy and Creative Ways to Make Decluttering Fun! If you haven’t signed up to my mailing list yet, here are the links with the freebie included when you sign up. 101 Things to Declutter From Your Bedroom Right Now! And don’t forget to PIN this article to spread the love! Thanks!